One of my favorite things about fermenting vegetables is that there really aren’t many rules. Make sure that your fermented veggies “to be” are under a brine solution or mixed with the right amount of good quality sea salt, that everything stays under the brine, and you should be fine. Remember when it comes to lacto fermented vegetables, to always choose a good quality sea salt that still has its natural profile and minerals in it, unlike refined table salt. 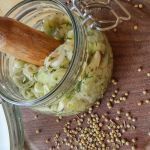 Today I’ll show you yet another interesting veggie to ferment, fermented leeks, and they go great in a legume salad, on their own or even in a super duper whopper sandwich 🙂 That’s right! When it comes to vegetable fermentation, let your imagination go wild! First, wash the leeks, making sure that there’s no dirt in between the leaves. Next, remove the roots and thinly slice the leeks, discard the dark green portion of the leaf, and place in a bowl. Finely slice the garlic cloves, and add the salt to the leeks, so that it can begin to release their liquids. Now, depending on how spicy you like your food, I added 1 small dried red pepper, but you can go wild. Grind the red pepper and the coriander seeds. 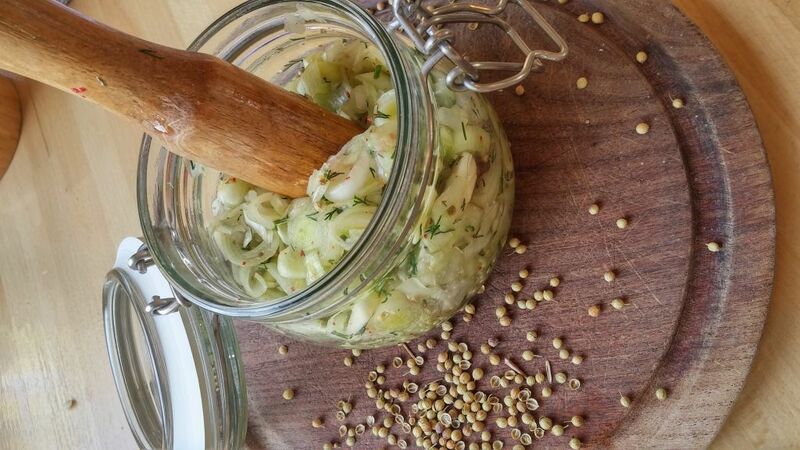 Finely chop the fresh dill and add to the bowl. Now, give it all a good massage. Finally, cram it all into your glass jar, with an airlock, and fill with water. Weight everything down, I use a plastic sheet and a shot glass, close the jar and leave out at room temperature for 3 – 7 days, away from direct sunlight, then transfer to the fridge. Leave them for a few more days, for the flavors to perfectly infuse. Then, dig in. 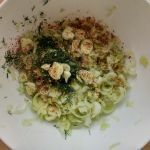 Plus, I’ve also recently joined Facebook, so pop in and like the page, that way you’ll stay up to date with my latest delicious posts. Have a question? I respond quickly.